This month's update is a very stripy one! It will be up on the website around 13th April. 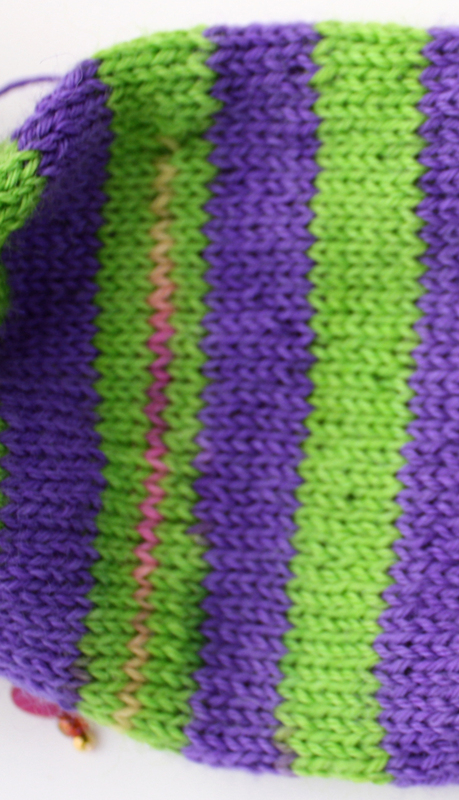 I've dyed up a few striped yarns in two- and three-colour varieties, including the purple and green one above. Although you can't have that one, it's mine ;-) The temptation was just too great! 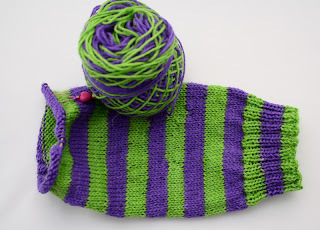 I am not usually a knitting control freak (habitually knitting socks of odd length, with uneven tension, lumpy weaving-in and all the staying-up power of Nora Batty's stockings) , but I thought I'd try keeping the continuity of the stripes this time instead of having them thin out around the ankle. Oh, and I like knitting round and round and round and round on that teeny tiny circular without having to stop and replace the needles! 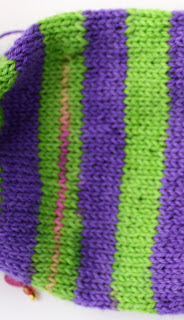 Hmm now I see my knitting close up like this it really is astonishingly bad tension-wise. All over the place in fact. I'm trying hard not to care about it...but when I see my friend Rhian's knitting, which is the neatest knitting in the world...I think maybe I should stick to the Monkeys in future, where I can hide the mess in a tangle of yarn-overs and purl stitches! Gorgeous colours! I've never done an afterthought heel, really should.